This exquisite newly reconstructed 2 bedrooms and 2 bathrooms apartment has everything you are looking for at an affordable price in the best location in Prague. You are just steps away from Wenceslas Square and surrounded by some of the most beautiful buildings in the city. This is the best location in Prague for public transportation with access to all three underground/metro lines and the trams system in the immediate area. We have spared no cost to make this apartment the one we would live in ourselves and you will find it a true gem hidden within full sight. After a hard day exploring Prague's architectural wonders and cultural insights, you will be able to come back to our charming apartment and soak up the pleasures of your day in an amiable, spacious and quiet environment. You can relax and enjoy a glass of wine on the balcony, or simply take time out on the comfortable leather sofas in the living room while watching a film on the flat screen tv with satellite. The spacious layout of the apartment allows for pleasant natural light and this further highlighted by the restored stained glass door and window allowing for increased amibiance and the fittings and amenites will suit your every need. Your stay in our apartment will be memorable and ensure that your Prague experience will be a delightful one. When I first visited Prague in 2002 I was immediately captivated by the city. I also own another two apartments that are available for rent. Monika of Charming Rentals manages all three apartments for me and I think if you rent one of them you will agree that she is the best of the best. The location of this apartment is simply superb. Just steps from the famous Wenceslas Square and perfectly located for all public transporation. This apartment is ideal for those wanting a central place from to explore the whole city. There are many, many restaurants and even a grocery store within easy walking distance of the apartment. The apartment was furnished to a highest standard. The custom kitchen includes every possible appliance including a conventional and a convection oven. The abiity to use the internet throughout the house is very convenient and the cable television make the apartment perfect for long or short stays. Two bathrooms including one ensuite. The bigger one has a shower and tub. Zone A/C with remote control for different areas of the apartment. This includes linens for the two single bed futons. So comfortably four people can stay here. Washer and Dryer are located in the main bathroom. Dryer and Washer are located in the main bathroom. Complete gourmet kitchen including a gas stove. Most everything you could ask for including pots and pans, dishes, utensils, etc. Custom kitchen with conventional oven, microwave and convection. All appliances from toaster to gourmet coffee maker. Everything you could want is here. Several English channels, full home theater system with DVD, surround sound, etc. This varies from time to time. Small balcony that overlooks the courtyard. Ideal for relaxing after are hard day exploring. 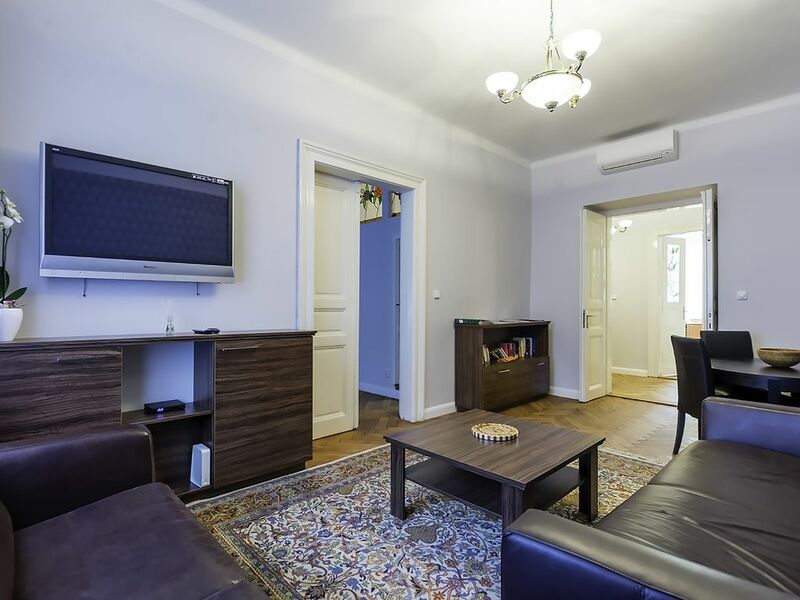 Directly in the center of the city, steps from Wenceslas Square, near all public transportation and is the finest and spacious apartment you will find in this entire area. So nice to have a roomy, clean 2 bedroom/2 full baths, lovely kitchen in a great location!! We are 2 Canadian, senior couples who have been to Prague before. If we ever return to this magical spot, we will definitely stay in this apartment. Huge hall, beautiful wood floors, laundry, 2 full bathrooms and a wonderful kitchen stocked with even breakfast granola, all for a very reasonable price! We were just off Wenceslas Square and could easily walk to the Old Town Square. It was also a good location for walking to the train station as we took a number of trips out to lovely villages on a few of our days. I would recommend that people visit during the Christmas season. It was so beautiful with the Christmas lights, the Old Town Square with its giant Christmas tree and all the Christmas markets. Stroll down beautifully lit streets and just enjoy the wonderful ambiance! Joyful! A lovely, well appointed apartment right in the heart of everything! We were two couples looking to experience Prague as residents for a few days and this place fit the bill perfectly. The kitchen was very updated, and there were two bedrooms each with its own bathroom/shower. It is close to the National Museum and the subway and within walking distance of the Old Town Square. I’ve stayed at many apartments in cities throughout the world over the past 25 years. This apartment may we’ll be one of the best places that I’ve ever found! Tastefully decorated and very comfortable, the flat is on the 2nd floor of a 100+year old building just off Wenceslas square. It has classic high ceilings and other nice period elements. The location makes it very convenient to all of the sites that Prague has to offer. I will absolutely plan to stay here on all future visits to Prague! Beautiful flat in a great location! My friend and I really enjoyed staying in this flat. It is beautiful, with original features including high ceilings and stained glass transoms and door panels. It was spotlessly clean and the kitchen and bathrooms were modern and up to date. - Air conditioning (it was very hot when we were in Prague). - Well supplied with soap, detergent, dishwasher detergent. - Beautiful kitchen with fridge/freezer and dishwasher. - One block to Wenceslas square -- very handy but far enough away to be quiet. - Two blocks to Mustek metro and many tram lines. It was very easy to find our way around Prague. - Many plug adapters were supplied. - Bedside table alarm clocks were supplied. - Train station pickup was arranged by Monika and went perfectly. - Transportation to airport was was arranged by Monika and went perfectly. - Monika was readily available to answer questions and respond to our concerns. - Only one bath towel (in addition to wash cloth and hand towel) was supplied per person for a one week stay. We would prefer two (one for me; one for my hair). - We ran out of hot water during our shower on the first few days. We contacted Monika because we thought there was a problem with the hot water supply. It turned out that the hot water tank is very small (125 litres). I like hot showers so I used up all the hot water during my shower. When I switched to warm showers all was well. Something to keep in mind. The location was fantastic and the apartment was as advertised. We were met by Peter and he showed us everything in the apartment and also made great recommendations for local restaurants. We were able to walk to everything we wanted to see and then return at the end of the day to relax and then head out again for dinner. I would recommend this location to anyone wanting to stay in the heart of Prague. The apartment was well appointed and very convenient for getting around in Prague. Monika was very accommodating and a pleasure to work with. Dear Michael, thank you very much for your complimentary review which we very much appreciate and are happy that you felt comfortable in the apartment and had a great time. We are only sad and confused to find out that we got 2 stars from you even your review is complimentary and neither we heard any complaints from you. Anyway, happy that you had a lovely stay. For those of you who like to exercise or relax in a sauna or enjoy massages, one of Prague's finest fitness and relax centres is a mere 200m from the apartment, directly on Wenceslas Square. For those who love independent cinematography, the enduring and well respected Svetozor cinema is only 100m from the apartment (through the Lucerna Passage).